Since the earliest times Ireland has had an odd and curious relationship with England, its closest neighbor. Even while suffering great oppression Irishmen were quick to join the British army and fight Englands wars around the world. This would also include fighting against fellow Irishmen. Some of the Irish people thought of these Irish soldiers as traitors. Only in recent years has the British government given proper credit to those Irish soldiers. The fact is that England could not have built its old empire without the Irish fighting its wars. During WWII when the Irish Brigade landed in Europe one rather posh british officer was heard to proclaim, "The Irish are here,by God now we'll get cracking !!!". Its no wonder that as each Irish regiment was formed Irishmen quickly filled their ranks. Where there were Irish Soldiers, saffron kilts and Warpipes were always close close by. When at the start of WWII the Republic of Ireland announced it would remain neutral, thousands and thousands of Irishmen went to Northern Ireland and England to enlist and fight the Nazi terror of Hitler. The Royal Irish Fusiliers and the Irish Guards were the most Irish and most famous of regiments. Even today the Irish Guards and the Royal Irish Regiment have large numbers of soldiers from the Irish Republic in their ranks. 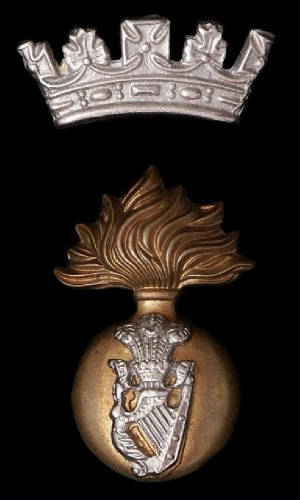 Above, the cap badge of the Royal Irish Fusiliers,the most famous and most Irish regiment of its day. 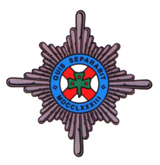 Above, the cap badge of the Irish Guards,also known as the Micks. Today this is the premier Irish regiment. Drawing large numbers to London from both Eire and Northern Ireland.